ARSA extremist Bengali terrorists were not successful in attacking the security outposts, and they fled to Bangladesh for fear of the retribution of the security troops. 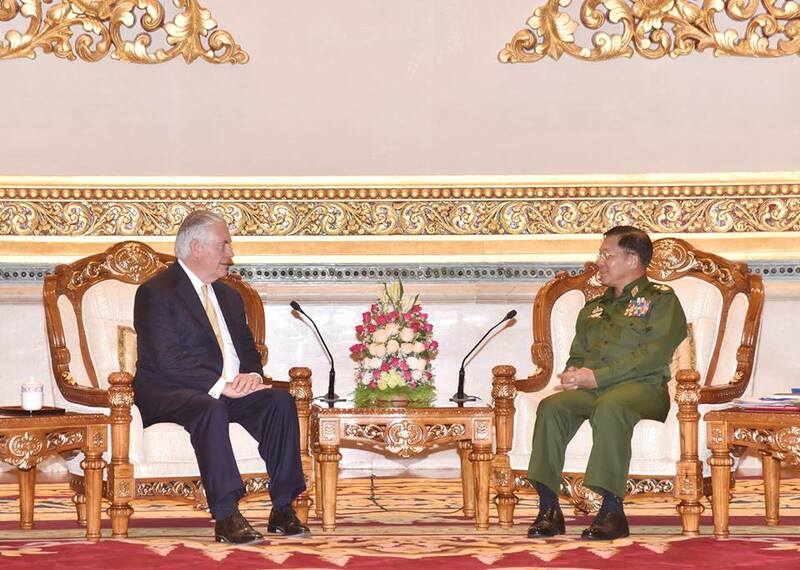 As the terrorist took their families together with them, the number of people who fled had become large, said Commander-in-Chief of Defence Services Senior General Min Aung Hlaing during his meeting with US Secretary of State Hon. Rex Tillerson at Zeyathiri Parlour here this afternoon. 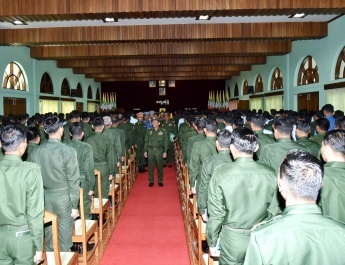 Also present at the meeting together with the Senior General were Deputy Commander-in-Chief of Defence Services Commanderin-Chief (Army) Vice-Senior General Soe Win, Chief of the General Staff (Army, Navy and Air) General Mya Tun Oo and senior military officers of the Office of the Commander-in-Chief (Army). 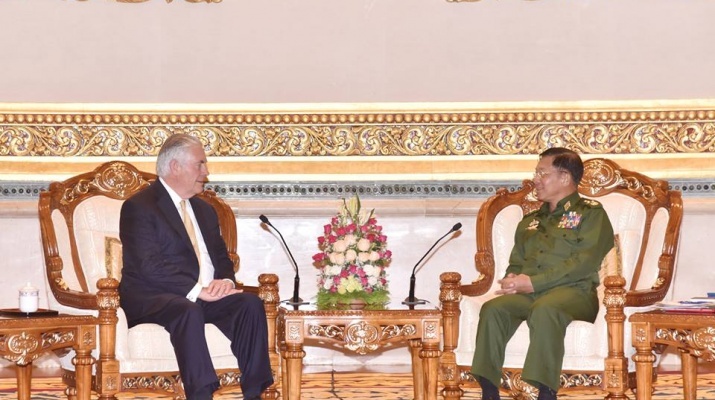 The US Secretary of State was accompanied by US Ambassador to Myanmar H.E. Mr. Scot Marciel and officials. 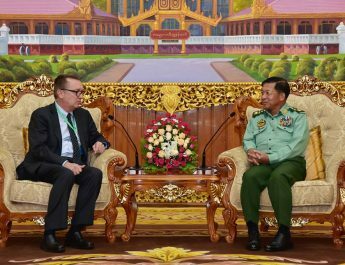 At the meeting, the Senior General said Myanmar and the US are close friends with over 70 years of diplomatic relations. Since the start of the democratic government in 2011, bilateral relations have been further strengthened. 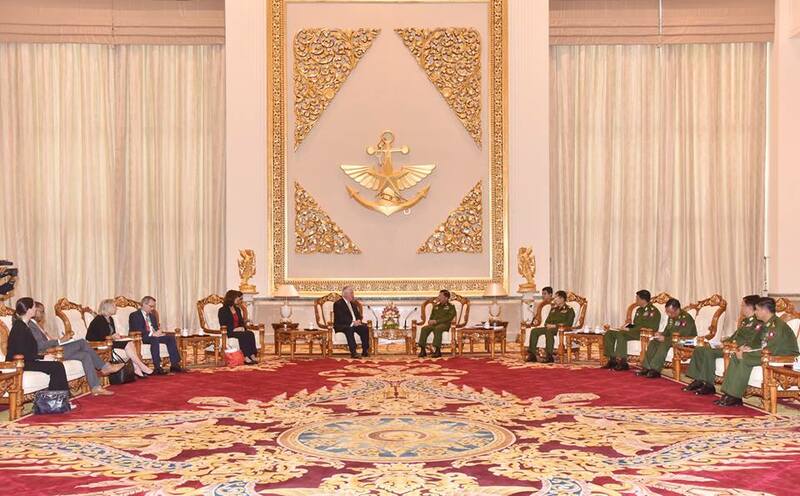 The Senior General thanked the US for support and encouragement for Myanmar’s reforms. Conflicts broke out in Rakhine region while the country has been in the progress of reforms in strengthening its democracy path. The country is trying to solve the issue. The US Secretary of State said despite some hardships bilateral relations are still closer. He expressed sorrow for the loss of the lives of security forces during the attacks of Bengali terrorists on their outposts in Rakhine State on 25 August. He said he denounced the terrorist acts, saying that after the incident Bengalis fled to Bangladesh. Some of the international quarters are showing interest in the issue. The US Congress is using the term which is something like “ethnic cleansing” in discussing the issue. The worrisome situation is that armed terrorists from other parts of the world may take foothold in the region giving this issue as the pretext. Hence, Myanmar government should cooperate with the international community. The sole wish of the US is to see Myanmar achieving greater success. He then asked information about the current situation. In his discussion, the Senior General said the 25 August incident this year was related to the ones that happened on 9 October 2016 and in 2012. On 9 October 2016, the extremist Bengali terrorists launched coordinated attacks on five border guard police posts. In the area clearance operation after the attacks, one military officer and 6 soldiers fell while 11 members of Myanmar Police Force were killed. However, 37 out of 68 guns that the Bengali terrorists took away with were recovered. In the incident that occurred on 25 October this year, the strength of extremist Bengali terrorists who attacked 30 security posts in synchronization was estimated to be about 4,000. However, after an investigation team led by Lt-Gen Aye Win of the Office of Commander-in-Chief (Army) had carried out an investigation, it was known that the strength was from 6,000 to 10,000. Since security forces took great care after the incident in 2016, only a camp was burnt down on 25 August 2017. Later, there were engagements between the security forces taking responsibility for community rule of law and ARSA extremist Bengali terrorists. There had been no engagement after 5 September. Thanks to the timely security duties of Tatmadawmen, lives of State service personnel, many local ethnics and Bengalis were protected. Western countries including the US have used words alleging that the Bengalis fled to Bangladesh due to the use of force from the Myanmar Tatmadaw. So they need to know the real situation. The number of Bengalis fleeing to Bangladesh from 25 August to 5 September was very small, and more had fled there only since then. The main reason is that the ARSA extremist Bengali terrorists fled to Bangladesh fearing counter-attack of security forces after they failed to carry out successful attacks on the security outposts. As they fled, they took their families, causing an exodus. To have control over the region and trigger fearfulness, those ARSA extremist Bengali terrorists brutally killed all including children, women and Bengalis of their same race cooperating with the government. Other Bengalis were also threateningly forced to flee to Bangladesh, while some were persuaded to live in a third country. During their ways, they left steadily without type of fleeing. As the international community assumed and said Bengalis fled from Myanmar due to torture but they did not know real situations, they need to have real situations. Preparations are being made to re-accept the Bengalis who left Myanmar, under the law. The situation must be acceptable for both local Rakhine ethnic people and Bengalis, and emphasis must be placed on wish of local Rakhine ethnic people who are real Myanmar citizens. Only when local Rakhine ethnic people accept it, will all the people satisfy it. If it is unacceptable situations, political instability may occur on the other hand. As such, he said that he had noted to carry out fair undertakings for them several times. Local Rakhine ethnic people know humanitarian aid provided by international community to Rakhine region is only for Bengalis, not for them. Bengalis who left for Bangladesh will be scrutinized and re-accepted under the 1982 Citizenship Law and the 1992 Myanmar-Bangladesh bilateral agreement. A similar event happened in 1978. At that time, although a total of 156,630 persons based on the statistics of Myanmar fled to Bangladesh, Myanmar accepted more than 186,900 persons proposed by Bangladesh under the agreement of both countries, increasing more than 30,000 persons. Now, it is impossible to accept the number of persons proposed by Bangladesh. The government will carry out such issues and the Tatmadaw will help the government. 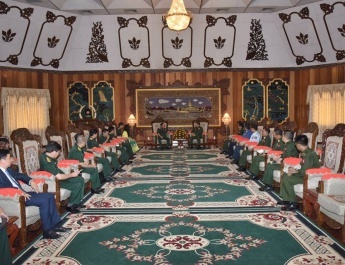 The Central Committee for the Implementation of Peace, Stability and Development in Rakhine State led by State Counsellor Daw Aung San Suu Kyi and relevant organizations from the state government are undertaking the tasks related to humanitarian aid with cooperation of the Tatmadaw. Next, they exchanged views on suggestions of the guest Secretary of State on releasing of information after forming the Investigation Team by the Tatmadaw in Rakhine State, appropriate matters for enabling international community to know real situations in Rakhine State, and preparations of the government to resettle returnee Bengalis, and cordially discussed seeking ways for two armed forces to join hands in combating terrorism and eradicating narcotic drugs.